One of the key goals of the fieldtrip to Ecuador (August-September) was to sample organic and volcanic (tephra) layers from sedimentary exposures with the aim of obtaining new information about past envrionmental change in the region. Our Ecuadorian collaborator, Dr Patricia Mothes (Instituto Geofisico), had identified four of sites she thought might be useful too us: El Fatima Dique, Mera “2” Dique, El Rosol and Vinillos. At the Fatima site, near Puyo, a thin organic bed was sampled sandwiched between volcanic ash deposits. Wood macrofossils from this deposit have been dated to the last glacial period. The first section was exposed by a road cut located at El Fatima Dique. Patricia had discovered the site earlier in the year and it had subsequently become somewhat overgrown which made finding the site more challenging. However, after driving over a narrow bridge we found the site and after a small amount of cleaning revealed c. 1.5m of sediments. The section was sampled at a resolution of 1cm throughout. We also managed to collect samples from the other side of the road. The second section was slightly thinner, at 1.41m, but probably represented the same stratigraphic layer.The sediments consisted of two tephra layers at the top and an organic layer at the bottom at the base of the second section a wood macrofossil was found. These two sections were the first of five collected on the trip. 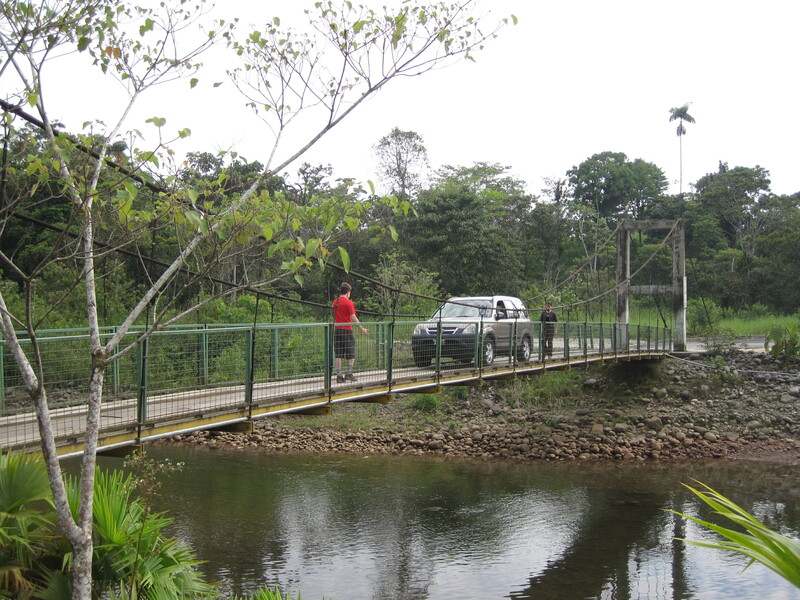 The second site which Patricia recommended we visit, Mera “2” Dique, was found c. 2km from the Mera “1” Dique sediments recovered in 2008 but on the other side of the river. 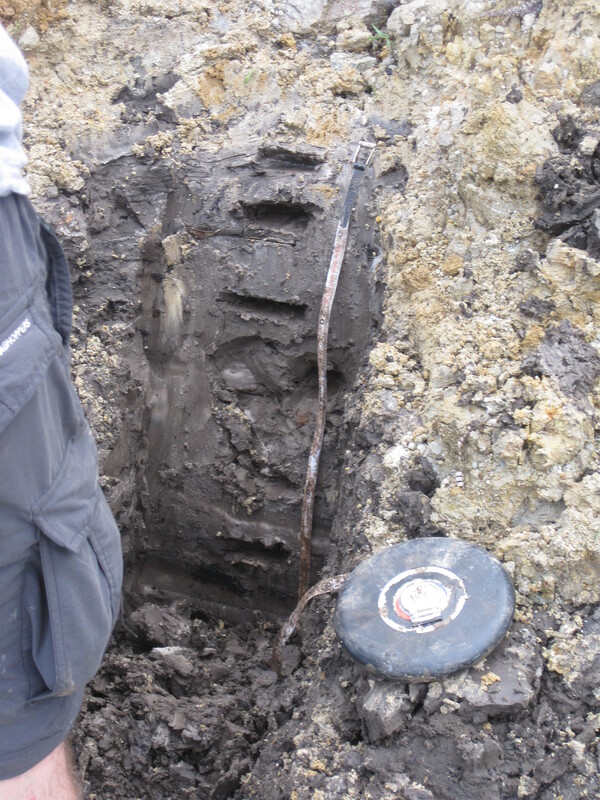 The Mera “2” site was extermely overgrown but following significant work with spades and machettes we revealed 12.27m of organic and tephra layers. Contained within these layers were numerous wood macrofossils. Examination of the topography and geological setting in the field suggested that the Mera “1” and “2” sites are part of the same depositional event. If this is the case the sites offer a rare opportunity to examine past envrironmental change through space as well as time. Laboratory analysis of the volcanic and organic material will confirm if these two sequences are truely part of the same depositional environment. The Mera “2” site was sampled every 5cm, with macrofossils taken throughout the site so we have plenty of material for comparison. Sediments recovered downstream of the dam on the Rio Tigre near Mera comprised c. 12 metres of interbedded organic and volcanic deposits. The third site recommended by Patricia to sample was called El Rosol. The site was situated close to the Fatima Dique site and it was suggested by Patricia that the tephra at this site could be analogous with those found at Fatima Dique; however, further geochemical analysis of the tephra is required to confirm this. The site had undergone a lot of mixing, however, we sampled a clear 60cm at a 5cm resolution, ensuring all wood macrofossils and macro charcoal were sampled. 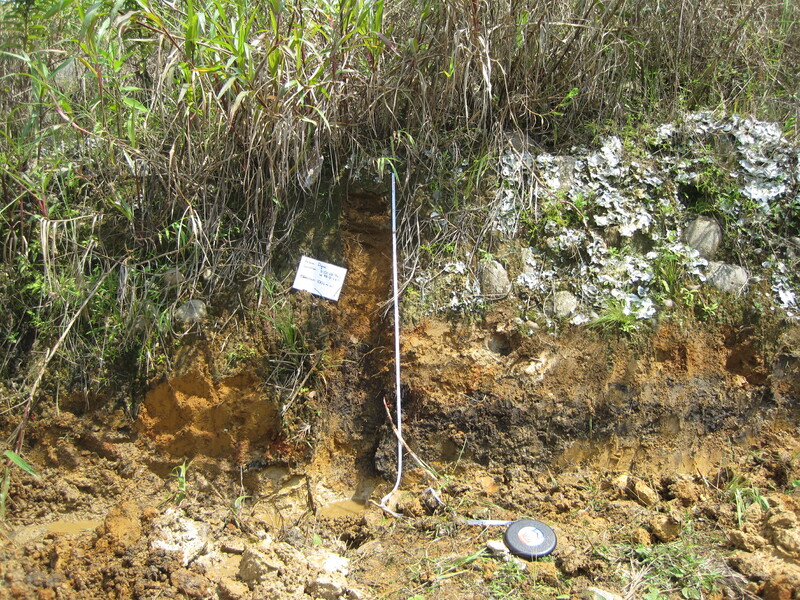 A small organic bed was discovered between some ash deposits at El Rosol. For the second leg of the field work we were based near the town of Baeza. During the second leg we sampled one more sediment section at Vinillos. 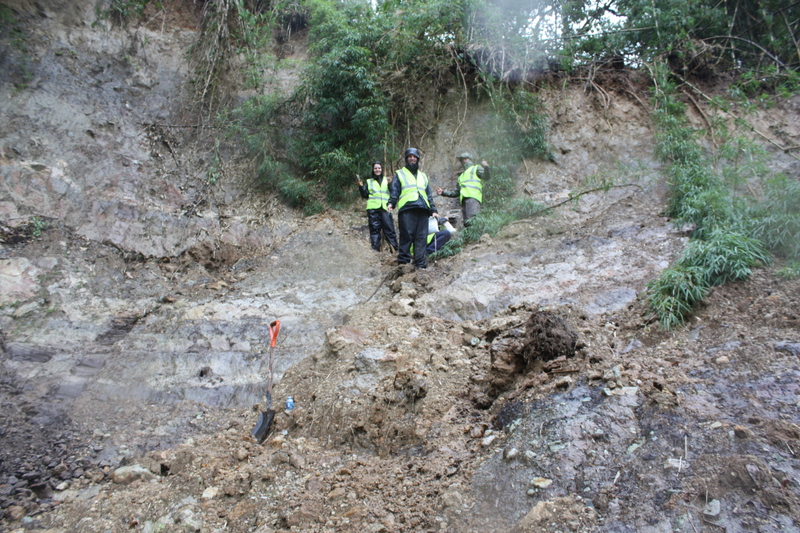 The Vinillos section measured 4.57m and contained interspersed organic and tephra layers with large macrofossils present. Preliminary radiocarbon dates from Vinillos suggest that deposition occured during the Holocene (last c. 11,700 years) making these likely the youngest sediments collected during this trip. 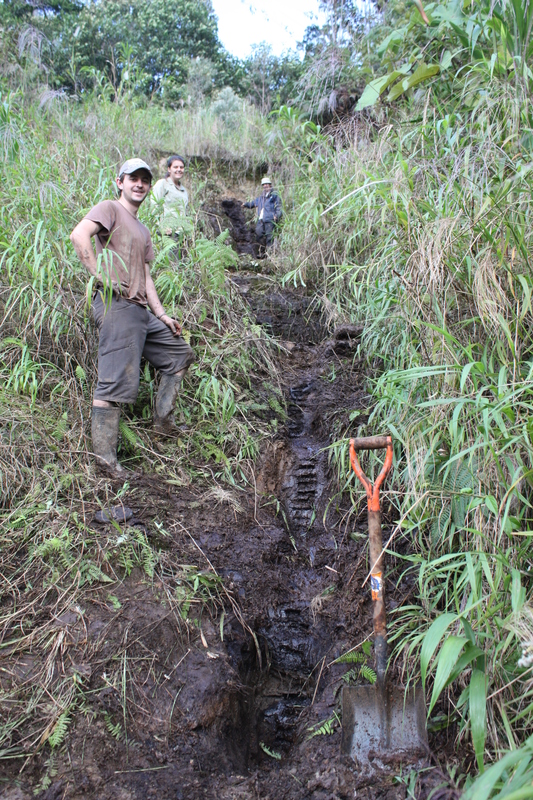 Sample collection was made interesting by the constant tropical rain, but the site was still sampled at a 5cm resolution. At Vinillos, close to the town of Baeza, a road cut had exposed a number of interbedded organic and volcanic layers. The sucessful recovery from five new sections at four study sites means that I (and probably future PhD students) have plenty of material to work on which will hopefully shed new insight on the nature of vegetation change on the eastern Andean flank during past global warm and cold events.